Sleek and simple describe this super comfortable full size sleeper sofa. 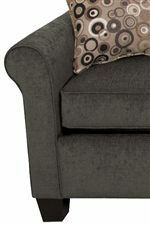 Its clean silhouette is achieved with a tight back, a P-shaped roll arm and an exposed wood leg. This fashion-forward frame can go from understated and sophisticated to fabulous and fun with the change of a fabric. The The D Series Full Size Sleeper Sofa by England at Crowley Furniture & Mattress in the Kansas City Area: Liberty and Lee's Summit, MO & Overland Park, KS area. Product availability may vary. Contact us for the most current availability on this product. Pillow Two 20" throw pillows. The The D Series collection is a great option if you are looking for Casual Casual furniture in the Kansas City Area: Liberty and Lee's Summit, MO & Overland Park, KS area.